- There has been elaborated analytic 3 D model for dependence of non –balanced Gibbs energy on partial pressure of components at the process of reconstruction iron- and vanadium containing ore concentrates in the stream of natural gas, which allowed determining the parameters of partial pressures to reduce the initial temperature of reconstruction to1000 C.
- For the first time with the use of ionic liquid (morpholine formate) as an electrolyte by EMF (electro moving force) method with a high exactness the partial and integral thermodynamic functions of triple compounds formed in systems M-X-I (M –Tl,Sb, Bi; X-S, Se, Te) have been determined. This allows considerably widening the opportunity of using EMF method in the research of inorganic systems. - For the first time polynuclear coordinated compounds of divalent platinum and palladium have been synthesized with biologically active ligands mercamine and β-mercaptoethanol containing functional groups specific for biological systems, their structure has been studied and the correlation between the structure and biological activity of complex (radioprotective, oncological and dermatological) has been established. - Compounds of thiosemicarbazones and hydrazones of carboxylic acids with metals of the first transitive period have been synthesized, their structure has been studied and it was established, that these compounds with inhibiting ability towards some ferments, are potential medicines against Alzheimer's disease and glaucoma. - Using X-ray method the formation of high temperature modification of iron and carbide Fe3C in carbonic nanopipes, obtained during catalytic pyrolysis of cyclohexane in the presence of ferrocene has been found. The high catalytic activity of Fe-containing carbon nanotube in aerobic oxidation of cumene and ethylbenzene has been established. - Kinetic regularities were studied and mathematical model of selective hydration reaction of phenyl acetylene –by-product, formed in the production of polystyrene on non-metal catalyst-mesoporous polymer carbonitride was constructed. - Encapsulation of medicine L-tyroxine on N-methyl N-benzyl derivative, obtained during the interaction of chitosan with formic aldehyde and benzaldehyde, which has much higher solubility was performed. This bio­complex was tested in vivo on mice, where for a month there was not noticed any reverse reaction. - It has been established, that the composite material based on organic bentonite and synthetic polyvinylpyrolidone using hydrothermal method, as compared to the used sorbents exhibits high solubility towards ions of heavy metals (Cr3+, Pb2+, etc.) 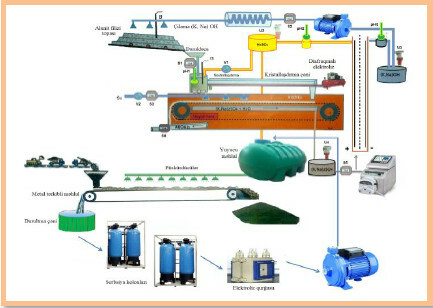 from waste waters of ore production, as well as to cationactive, anionactive and non-ionic dyers out of sewage of textile industry. - On the mass-transfer and rheological properties of oil dispersive media there have been suggested diffusive and gravitational mechanisms, the models of asphalt, resin and solid phase precipitations, which contain crude oil, and formation models of dense layer of particles on the surface of oil equipment. The offered models allow predicting the condition of oil equipment within a time and choosing optimum conditions to prolong the time of their exploitation. - As an electrochemical reference electrode in non-aqueous media there has been elaborated a new redox-system, consisting of octamethylferrocene and octamethyferricinium which according to the rate of redox processes, position of an electrode potential and stability in solutions is more perspective than currently used ferrocene-ferricinium system. Problem: Creation of scientific basis of complex retirement technology for ore and non-ore mineral resources of republic. There have been defined parameters and optimum regime of directed synthesis in rutile and anatase modifications of titanium loadstone dioxide by restoration of Adjinaur titan – concentrations with natural gas and the use of bioactive substance chitosane as a modificator, and technological scheme of the process has been elaborated. Gasimova A.M., Samedzade K.M., Kelbaliyev G.I., Mamedov A.N., Shadlinskaya G.V. Executors: Doctor of Chemistry, professor Asif Mamedov, scientific researcher Afarida Gasimova, PhD of Chemistry Kasum Samed –zade. There have been obtained gallium –sulfide glasses of lanthanides, where there is a transition from infrared field into visible one while exiting these glasses (l=976nm), it gives an opportunity to use them as anti-stocks luminophore materials in fibrous lines of connection and in the apparatus of night vision. Executors: Doctor of Chemistry, professor Bakhtiyarly Ikhtiyar, PhD of Chemistry Kurbanova Ruksana. There has been synthesized compound Cd3As2S3Se3 , having much higher photosensibility in the wide field of spectrum, as compared with CdS, which is used in solar batteries. Photosensitive, optic properties of Cd3As2S3Se3 has been studied and perspectiveness of its use as photoresistor in solar batteries has been shown. Imir I. Aiyev, Ceyran A.Ahmedova, Farzaliyev A.A. Phase equlibria in the As2Se3-Tl3As2S3Se3 system and properties of alloys.//Chemistry and chemical technology. 2017.Vol. 11, No. 2, p. 138–143. Executors: Doctor of Chemistry, professor Imir Aliyev, PhD of Chemistry Geyran Akhmedova (University Adiyaman, Turkey). Problem: Development of fundamental basis of catalysis, creation of new catalysts and adsorbents. There has been established selective action of biomimetic catalyst-perftorated tetraphenylporfirine of iron (per-FTPhPFe(III) OH/Al2O3) towards cyclohexane in the process of oxidation by hydrogen peroxide the mixture of cyclohexane with methylcyclohexane, and it has been shown, that at 2000 C in the process 11,3% of cyclohexanon is obtained, and at 2300 C – 23,2% of cyclohexene. Executors: academician Tofig Nagiyev, PhD of Chemistry Latifa Gasanova, scientific researcher Sariya Agamamedova. For the first time there has been made one-staged hardphase synthesis of metals ferrites out of their oxides and natural resources – Dashkesan loadstone under the influence of microwave radiation and their high activity in reaction of oxidation carbon mono-oxide has been fixed. Zulfugarova S.M., Askerov A.G., Gasanguliyeva N.M., Shakunova N.V., Aleskerova Z.F., Litvishkov Y.N., Talishinsky R.M. Investigation of surface acidity of heterogeneous catalysts by thermodesorbtion of ammonia under the influence of electromagnetic SHF-irradiation //OilGasGhemistry №1, 2017, Moscow, p.54-58. Executors: corresponding-member of ANAS Yuri Litvishkov, PhD of Chemistry Sima Zulfugarova, PhD of Chemistry Nargalem Gasankuliyeva, scientific researcher Zuleyha Aleskerova. There have been synthesized composites on the base of hydrogel of quarternized poly-4-vinylpyridine, containing nano-particles of silver, on which antibiotic doxycycline is immobiled and it has been established that in composition of nanocomposite doxycycline preserves its biological activity for a long time and its partial separation from the bearer is observed for 48 hours. Executors: Doctor of Chemistry Nizami Zeynalov, PhD of Chemistry Shamo Taptigov, academician Dilgam Tagiyev. There has been worked out the method of electrochemical obtaining of nanostructural solar elements CdS/CdTe on the base of glass /(In2O3,SnO2)/CdS(CdTe) and hibride unit of solar elements and nanocondensators, accumulating solar energy has been constructed. Executors: Doctor of Chemistry Akif Aliyev, PhD of Chemistry Vusala Medjidzade, dissertant Natavan Soltanova, academician Dilgam Tagiyev, PhD of Physics-Mathematics Shikhamir Eminov and PhD of Physics-Mathematics Namik Ismaylov (Institute of Physics ANAS). Problem: Technology and Modeling of chemical processes. There has been offered a method of monocrystals growing on the base of silver thiogallate (AgGaS2 ) with high roentgenodosimetric characteristics. It has been shown that crystals AgGaS2 have a high roentgenosibility in the wide interval of roentgenous radiation, which let us recommend these materials to create non-cooling and inertionless roentgenoregistrating apparatus and units on their base. Executors: Doctor of Chemistry, professor Mirsalim Asadov, Doctor of Physics and Mathematics Solmaz Mustafayeva (Institute of Physics ANAS). Semiconductor biomimetic electrode (Si) of catalase type the main working element of which is iron porphyrinic biomimetic catalyst, was first created. New on the basis of optimal designing of the complex for processing of cracking and pyrolysis gases the new method of modeling and optimal designing for chemical-technological systems consisting of determining the optimal coordinated material and heat flows has been elaborated. For the purpose of preserving long-term biological activity of doxorubicin antibiotics poly-N-vinylpyrrolidon and arabic gum nanobiocomposites comprising 14-18 nm Ag nanoparticles in carrier were synthesized for its immobilization. Physical-chemical bases of processing of mineral and renewable raw material and synthesis of new inorganic functional materials. Addition of molybdenum into the structure of carbide layer Cr-Ti formed on the surface of the steel SH-15, substantially increased its resistance to corrosion and erosion and thus the potential of pitting formation has been shifted to 200 mv in the positive direction. Such type steels processed by thermal diffusion can be used in many fields of industry, including military industry. The new production technology of 98.5% pure benzene – raw material suitable for alkylation processes- from light resin of pyrolysis condensate has been first suggested. This method is energy- and metal-saving, economically profitable, differs with its technologically simplicity and avoids the hydroalkylation stage. Metal-string complex with 11 nickel atoms in its linear molecular ring, which is a perspective material in nanoelectronics as a molecular conductor was synthesized for the first time. This complex, which contains mixed valence nickel particles, is the longest (32.4Å) among other know molecular conductors. Electrochemical obtaining method of thin films of Re-Se-Cu alloys based on rhenium chalcogenides was developed. These thin films with conversion and memory effect are perspective materials in the conversion of solar energy as a photoelectrode material in semi-conductors techniques. For theoretical justification of controlling heterogeneous crystallization process a new equation connecting equilibrium coordinates of phase diagrams, thermodynamic and kinetic parameters of crystallization process in binary and quasi binary systems was obtained and theoretically proved by applying in different systems. 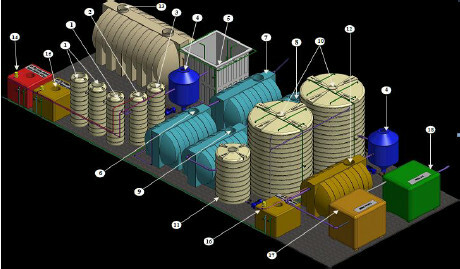 For calculation of efficiency level of stratification and separation of oil emulsion from water, quantity of separated water depending on time and installation for the process a new kinetic model of coalescence of water drops was created. Gel-immobilized catalytic systems on the basis of metal-polymer complexes with grafted to rubber oxygen and nitrogen containing ligands have been obtained. Such catalysts swelling at high temperature behave chemically as homogeneous catalysts; on the other hand, they can be easily separated from reaction media as a heterogeneous catalyst and recycled.